Specializes in the diagnosis, treatment and prevention of Gastrointestinal and Liver diseases. 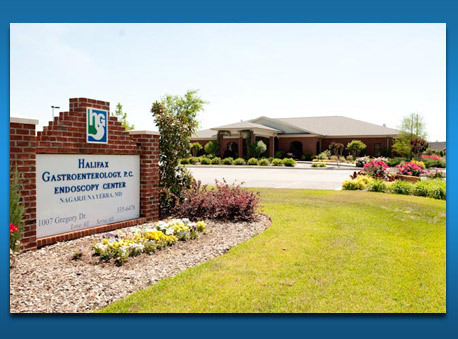 Halifax Gastroenterology is a single specialty center, dedicated solely to the care of gastroenterology patients. The center is designed to create an optimal environment for your care and the highest quality of patient care. Welcome to Halifax Gastroenterology, PC (HGPC) and Endoscopy Center. HGPC, state of the art facility, established in June of 2007 and is conveniently located at 1007 Gregory Drive, Roanoke Rapids, to serve the Roanoke Valley community with gastrointestinal disorders and or diseases at an affordable cost. Our endo center is accredited by Accreditation Association for Ambulatory Healthcare (AAAHC), known as the highest accreditation organization. We were commended by the organization as one of the best endo centers in North Carolina for maintaining the quality and safety standards with a very compassionate and well trained staff. Also, very recently, our facility has been awarded a Certificate of Need (CON) by Medicare, approving the increasing need for this facility in this community. As colorectal cancer is the second leading cause of cancer related deaths in the United States, and can be prevented by getting a colonoscopy done, rest assured, at our facility, you will receive the utmost gentle care. Do not hesitate to call us at 252-535-6478 for an appointment immediately. Our goal is to maintain the ever changing standards and guidelines of American College of Gastroenterology, American Gastroenterology Association, and American Society of Gastrointestinal Endoscopy. We are honored and proud to serve the Roanoke Valley community and are grateful for the opportunity given. The patient surveys prove time and time again that we are giving the community best service possible. © Halifax Gastroenterology. website by the computer guy & co.